It’s a good thing this is the pre-season and not much is expected from the starters. 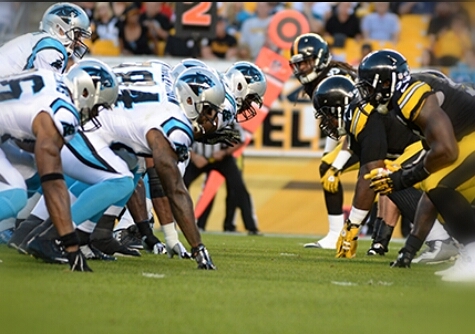 The Steelers backups, for the second week in a role, played uninspired football verses the Carolina Panthers. Micheal Vick couldn’t get the offense flowing and Landry Jones was not much better. The only highlight was a blocked punt by Roosevelt Nix. A major concern in this game was how the defense was pushed around in the run game. 22 of these players will be cut from the team yet as a fan you hope the starters remain healthy during the regular season. There was marginal pass rush to say the least and the secondary was inconsistent in coverage. Allowing 285 yards in the first is something to be concerned about even if it is the preseason. Missed tackles led to many of the big run plays by the The siliver lining in this the coaching staff is not showing much at all. Josh Harris probably didn’t have the performance necessary to remain on the team, and the deep passing game was non existent.Hopfully next well the offense will be more fluid with the staters. Tomlin likely won’t have a hard time deciding who to cut from the team and that is not necessarily a good thing. On a side note every time Martavis Bryant catches a pass it hurts Steeler Nation because they will not see his big play ability for at least a month. Hopefully Sammie Coates can help fill the void but so far he has shown little to make anyone believe that. Its exciting that the regular season is soon to begin because what transpired this entire pre season has not been classic Steeler football.